Standing up to speak I felt tentative, but it wasn’t the slight stomach turning before a speaking gig or worry about whether the technological wizardry would work. Instead, it was an awareness that the ground of my being was shifting, and it made me uncomfortable without knowing quite why. 20 or so years before I’d been in this same building, drawn here by the Rev’d Dr Peter Cameron’s lectures on fundamentalism. He’d been convicted of heresy by the Australian Presbyterian Church, the whole sorry saga prompted by his 1992 sermon, The Place of Women in the Church. This led to my journey into the Anglican church via the cathedral, now in pieces as a result of the Christchurch earthquakes, to theological training, ordination as an Anglican priest, school, military and hospital chaplaincy and back to the building where it all began, with my theology now labelled as ‘not Christian’ by church authorities in Wellington. I was here to speak to 40 women about Reimagining WomenSoul Beyond Religious Control. No pressure! They had gathered to mark a 1988 event where 150 feminist women from Christian and Pagan traditions had explored how spirituality could be an empowering transformative element for their lives and the world. The youngest then was 19 and the eldest 80. Once again, the eldest was 80, a skilled musician and Dominican nun, Cecily Sheehy, who electrifies a grand piano in ways that demand you boogie and sing. We did both, along with sharing memories, laughter and ideas. Along with the delight, there was a strong sense for me that I was at a wake, reminiscing about a time that had held great potential for women to break down the walls that made them powerless in the institutional church. However, despite women priests, deacons and bishops, the patriarchal, feudal system that underpins the church has not changed one iota. Women’s spiritual wisdom is still not taken seriously. Some have understandably subdued their anger and colluded in patriarchal church systems to be seen as credible. Others discovered that the sharp sword of theological reason can slice instinctual spirituality into harmless chunks through the intellectual search for the historical Jesus. Women and men suffer in the ongoing dislocation. Contemplating the myth of Inanna offers a perspective on the prospect of integration, but it’s brutal. 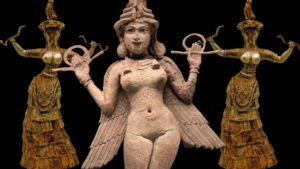 Inanna, Queen of Heaven heads off to see her sister Ereshkigal, Queen of the Underworld, or in other words, her dark shadow. Ereshkigal is furious and strips Inanna naked before killing her and leaving her hanging on a peg until her corpse turns into rotting green meat. See what I mean? The story has a redemptive aspect with the appearance of Geshtinanna, who Sylvia Brinton Perera suggests in Descent to the Goddess: A Way of Initiation for Women, is a model of one who can take her stand, hold her own value and be lovingly related to the masculine as well as directly to her own depths. One willing to suffer humanly, personally, the full spectrum that is the Goddess. And that’s where it unravels in Christianity where God remains King of All. From my perspective, nothing much will change until a rebalancing occurs, until we find pathways and methods to foster spirituality that integrates intellect and instinct, taking us beyond the patriarchal system that seems intent, perhaps unconsciously, on separating women from the source of our wisdom. To close the day in Christchurch, we began a spiral walk in time to KD Lang’s version of Hallelujah. As we wove our way in and out, I realised that in some strange, synchronistic way I had come full circle, radically changed by the process, absolutely aware there can be no God without Godde. Full text of the presentation: Reimagining WomenSoul Beyond Religious Control with pics final-converted. Pingback: 30 Years of Stroppy Women – did we make a dent?